Slow Silicone Catalyst - Industrial Plasters Ltd. Slow Silicone Catalyst is for use with Durasil and Smartsil Silicones, however it is also compatible with Silastic 3481 and 3483. Add to the silicone base at 10% by weight (you can also use volume to measure the catalyst which is accurate enough) this Catalyst is red in colour to assist with mixing. This Silicone Catalyst range is available in Fast, Very Fast and Slow setting speeds. Fast is recommended as standard. 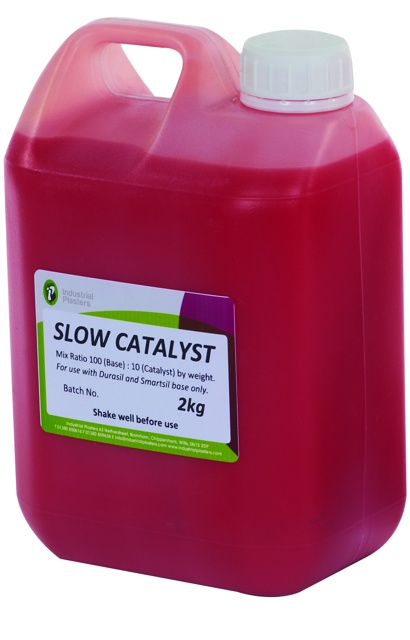 These catalyst are normally pigmented red to assist in mixing, however the Fast is available clear.